We are a leading Manufacturer of leather briefcase from Chennai, India. Our organization is widely recognized as topmost provider of Leather Briefcase to our clients. 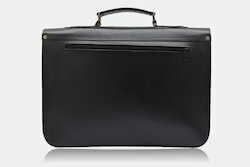 This briefcase has several compartments for keeping different items such as clothes, stationery items, money and others. This briefcase is truly portable and is considered one of the best available in market. The experts have fabricated entire range of this briefcase using 100% genuine leather of excellent quality. Looking for Leather Briefcase ?